Labeled state-to-function transition systems, FuTS for short, admit multiple transition schemes from states to functions of finite support over general semirings. As such they constitute a convenient modeling instrument to deal with stochastic process languages. In this paper, the notion of bisimulation induced by a FuTS is addressed from a coalgebraic point of view. A correspondence result is proven stating that FuTS-bisimulation coincides with the behavioral equivalence of the associated functor. As generic examples, the concrete existing equivalences for the core of the stochastic process algebras PEPA and IML are related to the bisimulation of specific FuTS, providing via the correspondence result coalgebraic justification of the equivalences of these calculi. Latella, D, Massink, M, & de Vink, E.P. (2012). 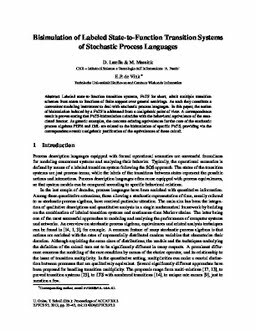 Bisimulation of Labeled State-to-Function Transition Systems of Stochastic Process Languages. In U Golas & T Soboll (Eds. ), Proceedings Seventh ACCAT Workshop on Applied and Computational Category Theory, Tallinn, 1 April 2012. EPTCS 93.